1 December 2018 Ground Transportation and Ivan the Terra-Bus! There have been two things in my journals that have gotten the biggest response. Growing a beard and Ivan the Terra-bus have had by far the biggest response! Why these two have been the most interesting to my readers is beyond me (seriously). But, I'm here to tell you about the interesting things that I'm seeing and experiencing and many of you have asked about how we get around here in the Antarctic and even more of you had questions specifically about Ivan. So here you go! 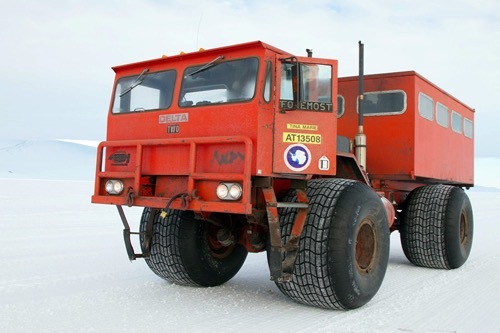 The most well-known vehicle in Antarctica has got to be Ivan the Terra-Bus. 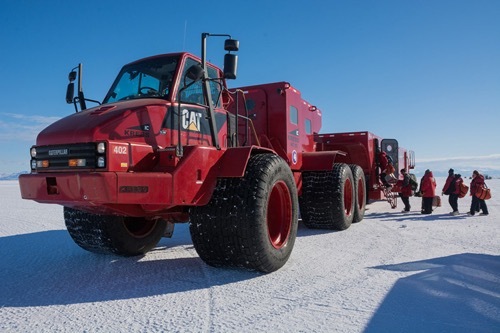 The iconic "Ivan the Terra-Bus" has been transporting USAP participants from the airfields on the Ross Ice Shelf to McMurdo Station for decades. Ivan is a huge passenger transport, 46' long, over 12' wide and 14' tall with tires that are almost 6' (feet) in diameter. It holds 56 passengers and its engine holds 5 gallons (not quarts) of oil. Ivan's fuel tank holds 80 gallons of diesel fuel (66 Imperial gallons) and gets about 2 miles per gallon. Ivan seats 56 passengers and their gear. Ivan the TerraBus was built in 1993. 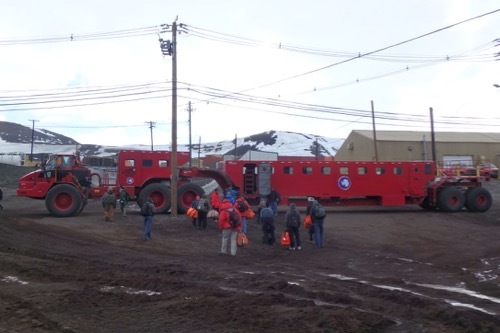 USAP participants unload gear from "Ivan the Terra-Bus." Ivan weighs 67,000 pounds empty. Ivan's driver says that on a really good day, Ivan might get up to a top speed of 26 miles per hour! Although that is way over the speed limit on the ice road between the Willy (Williams) and Phoenix Air Fields. 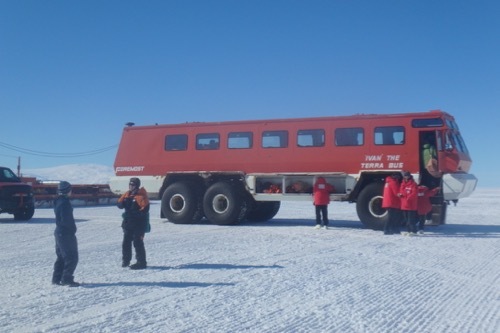 Ivan the Terra Bus is world famous and has its own song on YouTube (it isn't really very good so I didn't include it here) and there is a video taken from inside Ivan of the driving conditions on the road from the airfield to McMurdo Station that we rode in on. You could look that one up on your own if you are interested (it isn't that exciting). All of the vehicles are designed or modified to distribute their weight over as large of an area as possible. That way they are less likely to sink into the snow and get stuck. Ivan's six, six foot tall tires are about two feet wide to spread all 67,000 pounds of weight over as much area as possible. Ivan isn't the only HUGE people mover down here. There is also "Kress" and "Delta." Ivan isn't the only huge transport vehicle. This is "Kress" Kress people-mover, McMurdo Station, Antarctica Photo Credit: Mike Lucibella USAP Delta people--mover, McMurdo Station, Antarctica Photo Credit: Mike Lucibella It is the same for the large wheeled vehicles "in town." In the pictures below you can see some of the interesting ways that weight is distributed! 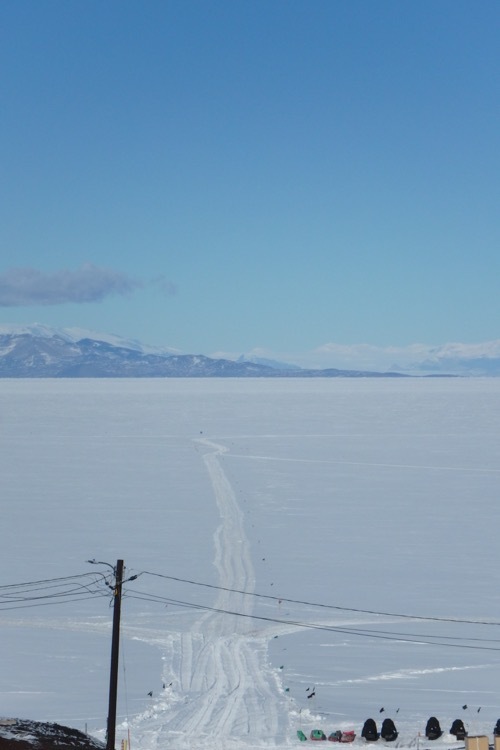 This road leads out of McMurdo south onto the ice (Ross Ice Shelf). 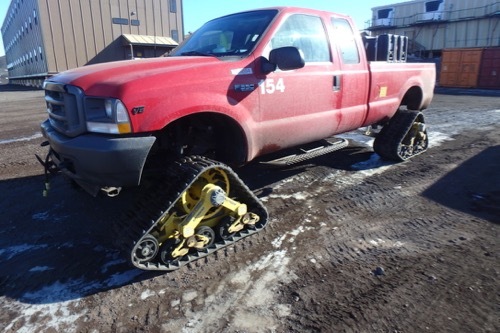 An F-350 MacTrac, commonly seen in McMurdo Station, Antarctica. Most of the vehicles are Ford F-350 and E-350 trucks and vans. ALL of them are four-wheel drive and almost all of them have either oversized tires or MacTracs. 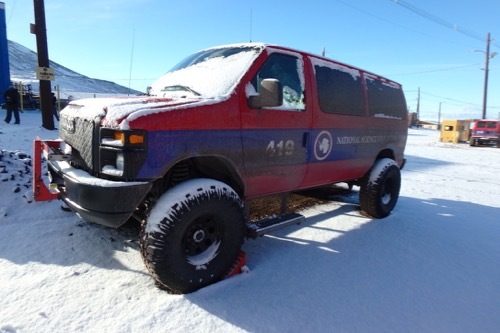 Commonly seen around "town" an E-350 4x4 van at McMurdo Station, Antarctica. The German made PistenBully has some nice features like heated windshield wipers! They are fully enclosed with a heated cab. The cabs are optimized for use in sub-zero weather or cold conditions worsened by wind chill, with strong forced heating and a windshield designed to be kept clear of internal and external ice or condensation. This PistenBully doesn't have a trailer...but it DOES have a sticker on it from my Boy Scout Troop! (Don't worry, it isn't on there permanently.) 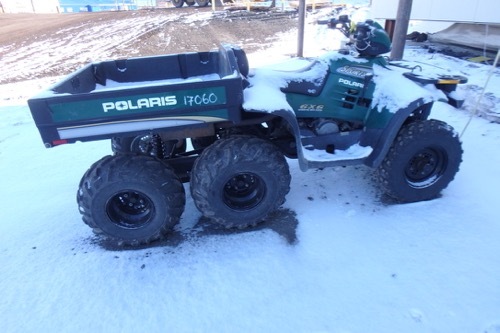 They can carry up to eight people depending on how much equipment there is but they can be connected to a tracked trailer to have a larger capacity. 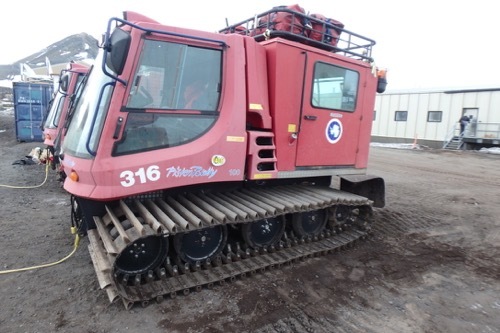 PistenBully tracked carriers are obviously made specifically for use in the snow and ice! Almost all of the vehicles have more wheels or tracks to distribute the weight over a larger area. We had out "check-out" on snowmachines (snowmobiles) this morning and we'll go on a "fam-ride" later today. There are lots of required training and proficiency tests and checks here, just to make sure, one last time, that EVERYONE is completely competent BEFORE there is a problem. Snowmobiles are used here to travel short distances in good weather. Finding out that someone doesn't know how to handle a bad situation AFTER it has happened is too late. 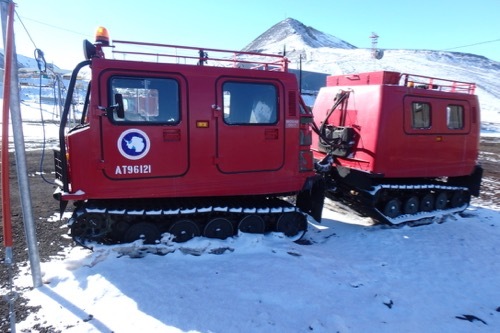 Here is an article from the "Antarctic Sun" titled "McMurdo Station On The Move" about modes of transportation here in McMurdo Station. 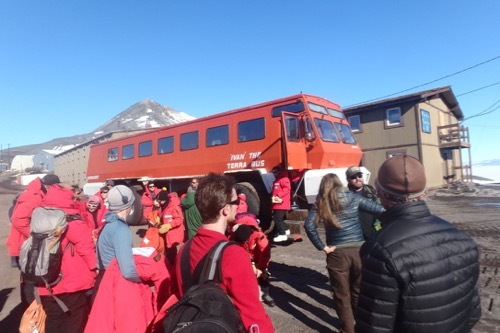 I rode in some vehicles like the PistonBuddy and Ivan the Terra Bus on the glaciers in Iceland. The very slow ride gives you lots of time to take pictures. MK, Fun right? I'm pretty sure that we didn't exceed 15 mph in Ivan! how big are the wheels and how tall is the bus and how many people can it hold and how much snow do you think it can go through. Ivan is a huge passenger transport, 46' long, over 12' wide and 14' tall with tires that are almost 6' (feet) in diameter. It holds 56 passengers and it's engine holds 5 gallons (not quarts) of oil. Ivan's fuel tank holds 80 gallons of diesel fuel (66 Imperial gallons) and gets about 2 miles per gallon. That is a good question, I don't know how much snow it will go through. hi im a student from dansville middle school i was wondering how do they get the modes of transportation there? Alex, Big things like these are usually brought in on big cargo ships that follow an icebreaker in when it is possible (usually some time in January). Does Ivan have heated fuel like the plane you took to get there ? Camden, I don't think so, although all of the vehicle have plug-ins for an engine block heater and battery heaters when they are parked at a building to keep them from getting too cold.